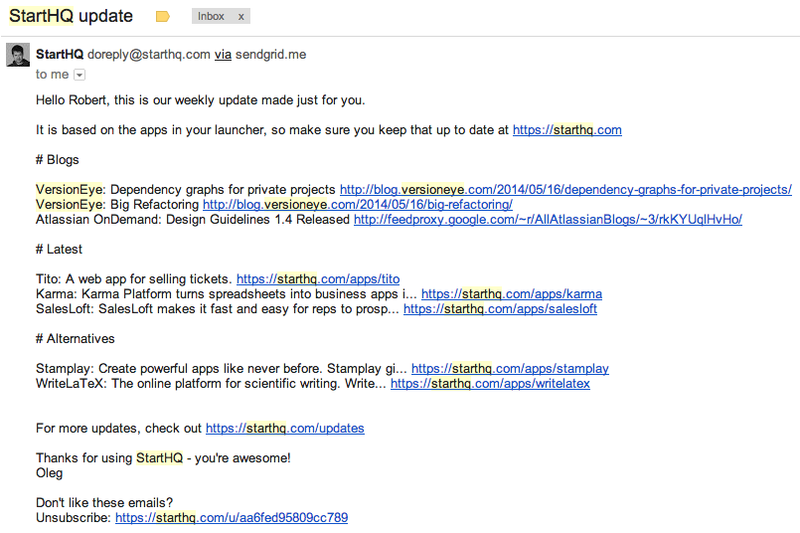 StartHQ is one of the few tools I’m using every day! It is my default Tab Launcher for Chrome. Everytime I open a new tab in Chrome I see my StartHQ dashboard. This works over the StartHQ Chrome extension. The cool thing here is that I can customize my Tab Launcher with the apps I like and everything is stored in the cloud. In that way I can use the same Tab Launcher over all my devices. But the coolest feature is the unified search over all my favorite web apps. 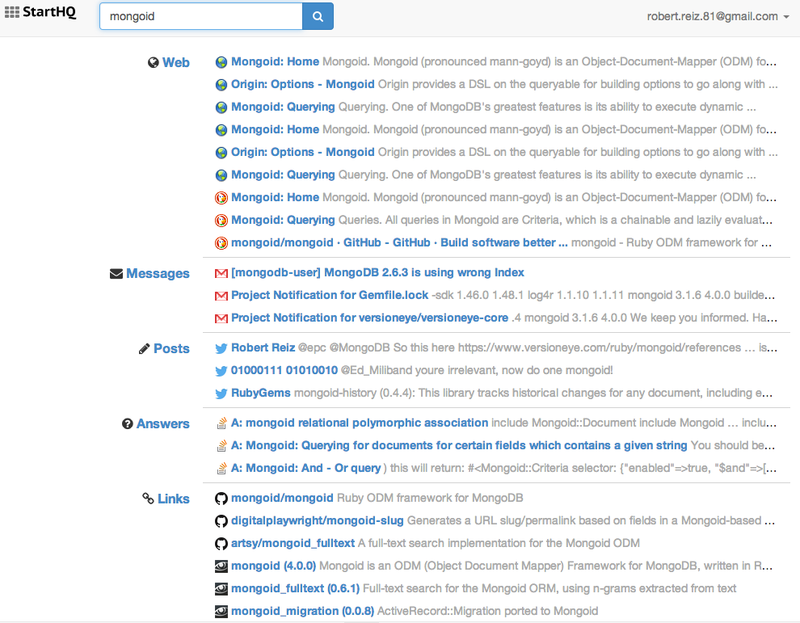 Let’s say I trigger a “MongoID” search on my StartHQ dashboard. This is the result list. I get results from GMail, StackOverflow, DuckDuckGo, Twitter, GitHub and VersionEye. All in one place. It works the same for document searches. 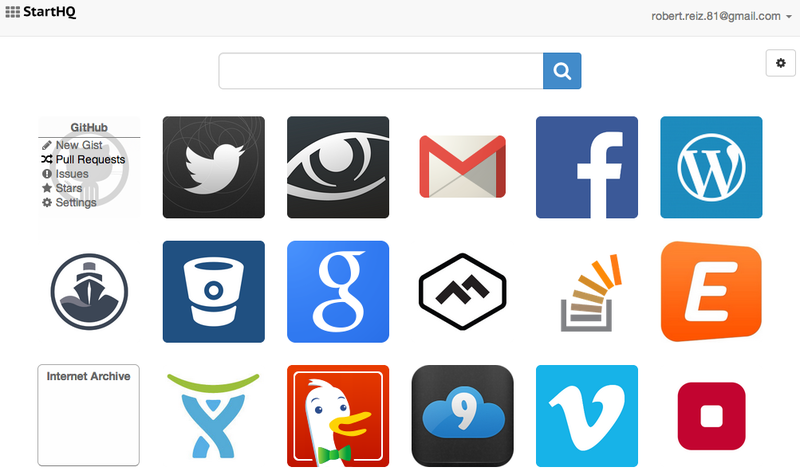 If you don’t know where you stored a document, simply search through all your web apps with StartHQ. The unified search works through the extension, which is also available for Firefox, Safari and Opera. If you are logged in into your favorite Apps, the StartHQ Chrome AddOn can search through them and offer your deep links to your Cloud Content. The company StartHQ itself doesn’t have really access to your cloud services. Privacy wise it’s all safe. That’s awesome! Isn’t it? I really like the format because it’s short. In each section there are never more than 3 links! And they are always important to me. That’s perfect. It’s not another email newsletter with a never ending link collection. Check it out today and give it a try. And let us know what you think on Twitter and Google+. VersionEye is already integrated into the StartHQ search. In future we will work on a deeper integration with StartHQ.